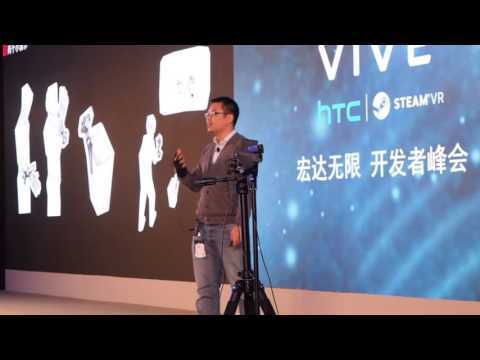 "Vive delay the result of a VERY VERY big breakthrough to be shown at CES"
"That is according to HTC CEO Cher Wang who said as much at this week’s HTC Vive Unbound event in Beijing, China. According to Engadget the delay came because of “a very, very big technological breakthrough”, apparently so significant that the company decided not to release the original design for the consumer version of the device. “We shouldn’t make our users swap their systems later just so we could meet the December shipping date,” Wang said, later teasing that said breakthrough should be revealed at CES 2016 on 6th – 9th January." This sounds promising. Can't wait to see what they have at CES. The recent leaks (if true) reveal a nice new design for the controllers. I am trying to think of what this could be. Let's assume HTC is telling the truth and the breakthrough came in late november early december. That gives them most of December, January, February and March to retrofit their consumer version, make any necessary updates to their manufacturing process, test those changes, and then start manufacturing the thing before the April release. That is not allot of time to make a big change so I would think it would have to be something easy to implement. I don't think this would be an only software related change because then they would still be able to ship what they have. I also think the statement "a very, very big technological breakthrough" mean that this is a game changer and is going to blow everyones mind its not going to be a 10% increase in pixels or some other incremental change, not that that wouldn't be welcome but it's not "a very, very big technological breakthrough". I dont think its going to a 2K, 3K, or 4K screen swap. Most PC's cant handle the current screen resolution a it is. I dont think its going to be tracking accuracy or volume. Its already incredibly accurate and the tracking volume limits are more than most people have to work with. I would be very surprised if it was something like eye tracking since the largest benefit would be foveated rendering which would require support from Nvidia and/or AMD. There is just not enough time to pull that off. Unless it's actually been in the works for some time and there was a single roadblock that was just overcome. If that is the case they will blow Oculus out of the water for CV1. I think wireless is also out of the question. to much change in two small a time frame, unless, again, they have been working on it and there was only a single small but seemingly insurmountable roadblock. I think I will be putting my money on Optics. They can make a huge differences in FOV as well as SDE, and chromatic aberration, and more. Even though the lenses themselves may be drastically changing, the overall shape will probably not change all that much and could be fairly easy to implement any HMD hardware changes. So perhaps 150+ degrees of FOV? that's my guess anyway. I think if I could chose a single feature for this to be, without taking reality into account, I would want this to be accurate low latency eye tracking. That would enable the possibility of foveated rendering, which would allow for photo realistic graphics on current gen graphics cards at 2k resolutions and still have processing power to spare! Even Crysis on Ultra settings would not be a problem! The next gen pascal cards might even be able to do that at 4K! It really is amazing how much of our FOV is a blurry mess and how little of it is actually in focus and able to pick out fine details, and that's with 20/20 vision. I'm guessing it can't be anything that would affect PC performance this far along. Devs would not be happy if this were true. It's possible it has something to do with the front-facing camera. Perhaps it's more than just a camera that detects and warns the user of nearby objects, and now it's able to project a video feed to the user (maybe even adding AR effects!). HTC does have some pretty good cameras on their smartphones after all. Just throwing that out as a possibility! Yeah, some clueful folks on reddit are also suggesting cameras. It makes sense. Anyone with pets is taking their life in their hands when they put theses things on. Just saw a private demo with a convincing full body scan... wow. Can't wait until we announce this. Don't normally tease, but so cool. UploadVR.com has an article about what looks to be the "very very big breakthrough"
If that is in fact the case. I am disappointed. The VDK2's already have the camera so this looks t be a completely software based "breakthough". So why the delay? Updating software is easy, and Valve does an exceptional job of it via Steam. I think there is another reason they delayed and there just not tell us. AARRRGGGG!! I want the Rift HMD with Lighthouse tracking! hhmmm perhaps the "breakthrough" was the lenses? Yes thats awsome that the Vive is the official Omni HMD of the tournament, So i guess everyone in the tournament will have a Vive and have decoupled movement, aiming/shooting, and looking? If so thats amazing! I am still waiting for CES to end before i give up hope on the "breakthrough" actually being something worthy of such a delay. I still have yet to read anything directly from HTC or Valve saying what this "breakthrough" is. For all we know it might not even be a part of these VDK2's. I agree. They started this hype so it's up to them to deliver. @Wolvenworks I would be shocked if the Vive was $600. My guess is somewhere between $600 and $800. It does come with controllers remember. @xxann5 and how much is Oculus again, with the controllers? i forgot, but i heard they're gonna sell controlers like what vive has IIRC, right? The Rift is $599 USD, without the controllers. They have not released the price of the controllers. yes the Vive will come with two controllers. So untill HTC releases the price of the Vive and Oculus releases the price of the Touch controllers we will not know what complete package is cheaper. Minimum wage in the US is $7.25 USD an hour and at 40 hours a week that is... what like 80,000 Rupee's or so? That seems kind of low to me. I think VR in 2016 is going to be pretty damn expensive no matter where you live.